In early January 2018 Carroll Cave Conservancy bought and installed another stream level data logger. The new logger is located about 150 feet downstream from Thunder Falls. 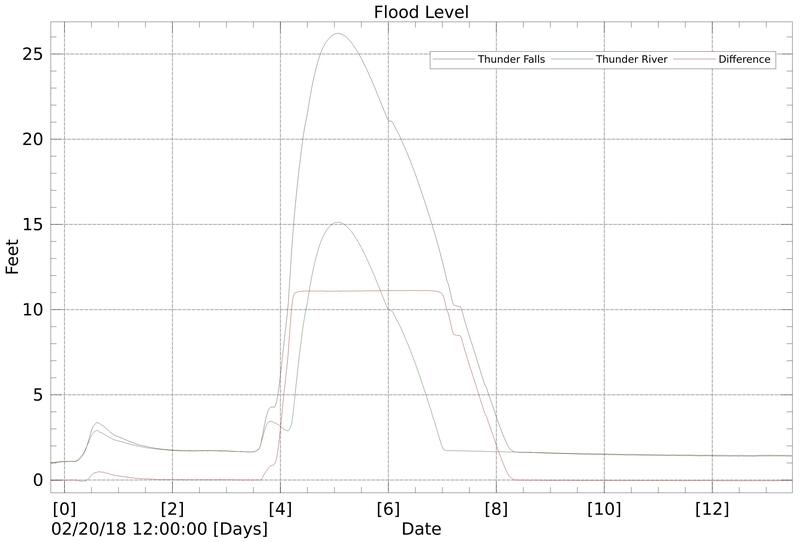 The hypothesis supporting the new logger is that Lower Thunder River floods before Upper Thunder River. 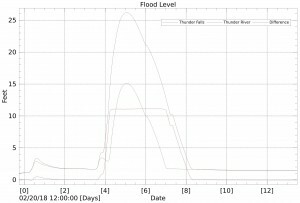 The flood progression is for Upper Thunder River to run at normal or slightly elevated levels until Lower Thunder River is completely flooded. Only then does the water level in Upper Thunder River begin to rise. We now have data to support the hypothesis. There was a fairly major flood in late February 2018. Data from that event is attached to this note as a CSV file. I have also attached a graph of the data as a JPG file. This data comes from the data logger just below the ladder in Upper Thunder River and from the new data logger below Thunder Falls. The graph includes a plot of the difference in level between the water depth at the two loggers. The graph shows that the two levels rise for a short time in lock-step. The level in Lower Thunder River then continues to rise while the level in Upper Thunder River remains fairly flat. Once the level in Lower Thunder River reaches about 12 feet, the two levels start rising together. The same pattern is evident as the levels go down. Both data loggers show the level going down at about the same rate until Lower Thunder River reaches a depth of about 12 feet. From there the level in Upper Thunder River stays fairly constant while the level in Lower Thunder River continues to fall. This pattern is most visible in the graph line showing the difference between the two levels. The difference goes flat at about 11 feet, which is about the vertical distance between the two data loggers. The conclusion is that the cave floods Lower Thunder River first. Upper Thunder River begins to flood only after the water has over-topped the lip of Thunder Falls. This is not the highest flood we have seen. It is about 6 to 8 feet below the highest flood we have seen in Upper Thunder River. That means Lower Thunder River floods all the way to the ceiling. Any trip to Lower Thunder River must pay careful attention to the weather.